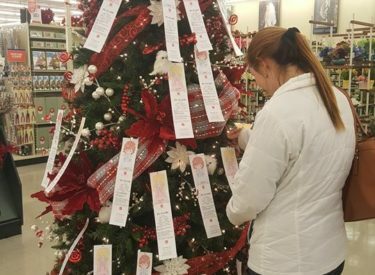 A customer at Hobby Lobby is among the first to take a request from this year's Angel Trees. The first volunteers taking tags from the 2018 Salvation Army Angel Trees have their shopping lists and are ready to do their part to help Santa make Christmas happier for some local families. Phylisa Kimbrel, who is coordinating the Angel Tree project this year, said Walmart will have Angels at both doors, and Brace Books and More will have book angels. Lists are also available at Exploration Destination, Blackwell Dentistry, Community National Bank, Hobby Lobby, Pioneer Technology Center, and University Center at Ponca City. “Many of these will be set up after Thanksgiving,” Kimbrel said. Kimbrel said all the participating families have already been selected.